Bet Winnipeg to win Western Conference at +550 with Karamba. Bet Vegas to win Western Conference at +500 with Karamba. Bet Colorado to win Western Conference at +2100 with 888Sport. As the Nashville Predators learned the hard way last spring, winning the Presidents Trophy doesn’t mean squat come playoff time. Of the last 10 Stanley Cup winners, only one (the 2012-13 Chicago Blackhawks) also won the trophy for most points in the regular season. Nashville, 53-18-11 last year, remains an attractive bet to win not only their division, but the Western Conference crown as well. At +475 with Karamba, the Predators are the choice, in fact, to win the West right now. But I like a couple others above them, and here’s why, along with a sleeper or two for fans of NHL betting. I really like the Winnipeg Jets (+550). This is a team that can play fast, up-tempo hockey and score a lot. Or, it can get down in the muck and slug it out with you, too. Not only are the Jets big and skilled, but they’re young, with an average age of just 26. They are built to be able to withstand the grueling physical slog of the NHL playoffs. This is a team that went to the Western finals but lost to upstart Vegas. So, they’re going to have to that “Let’s take the next step” mentality all year long. Winnipeg has very good scoring depth with forwards such as Mark Scheifele, 44-goal scorer Patrik Laine, Blake Wheeler, Kyle Connor and Nikolaj Ehlers. 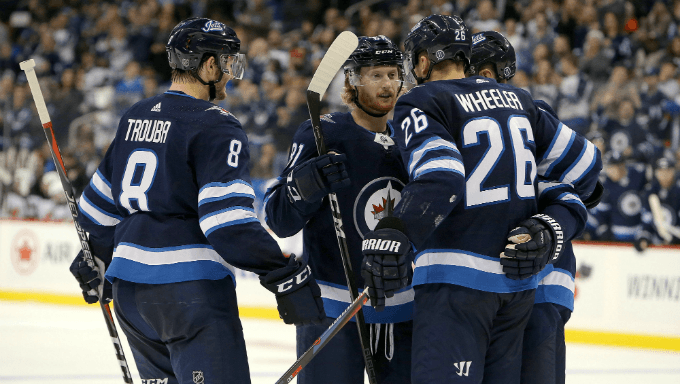 They have a big, rough but mobile defense, led by Dustin Byfuglien, Josh Morrissey and Tyler Myers and a young goalie, Connor Hellebuyck, who went 44-11-9 with a .924 saves percentage. Plus, the Jets have a veteran coach, Paul Maurice, who has won a Cup before (2006 for Carolina). I think this is the Year of the Jet. Nashville should be right there again for another Western title, but I think this Winnipeg team is younger and just a little bit hungrier. Bet Winnipeg at +550 with Karamba. Not only did the Vegas Golden Knights (+500) come close to winning it all in their first season, they went shopping this summer and added a couple of big pieces that will make them tough to dethrone as Western Conference champs. Vegas lured veteran free agent center Paul Stastny away from Winnipeg, and traded for Montreal Canadiens captain Max Pacioretty.They join a team that already could put pucks in the net at a rapid rate. Only Winnipeg (277-272) scored more goals than the Golden Knights in the West, and now they have two new, proven point producers. Everyone wants to buy into the theory that the Golden Knights were a once-in-a-lifetime fluke, that reality will hit hard in the second year. Don’t be one of them. Vegas did lose a couple of forwards off the Cinderella team that captured the attention of the world (James Neal, David Perron), but Stastny and Pacioretty are an upgrade. Marc-Andre Fleury remains the goalie, and all he ever seems to do is win. Gerard Gallant is a coach that players really like to play for. Vegas is a good play right at +500 with Karmaba. They’re not going away. The Colorado Avalanche suffered through one of the worst seasons in modern NHL history in 2016-17, posting a league-low 48 points. A year later, the Avs were in the playoffs. They didn’t lose anyone of major significance from that roster and added a few pieces that could make them better. Don’t count out this team from being on the same kind of chart path of teams like Winnipeg and Nashville. They are building from within, and at +2100 with 888Sport, they are an attractive sleeper pick. Colorado has one of the best top lines in the league, with Hart Trophy finalist Nathan MacKinnon flanked by Gabe Landeskog and Mikko Rantanen. While there are questions about their secondary scoring, they have a mobile, two-way defense, led by Erik Johnson, Tyson Barrie and Sam Girard. The goaltending, with Semyon Varlamov and newcomer Philipp Grubauer from the Capitals, looks deeper than most in the West. The Avs also have a lot of cap room ($9.9 million, only three teams have more per CapFriendly), so if they are good enough to be buyers by the trade deadline, they should have more purchasing power than most others. Make Colorado your sleeper pick at +2100 at 888Sport. The San Jose Sharks (+570 at 888Sport) have become a fashionable pick of late, and why not? They went out and got the best player available on the trade market this summer in dynamic all-around defenseman Erik Karlsson. The thought of either him or veteran Brent Burns manning the power play is a frightening one for NHL opposing goalies. Karlsson is probably the NHL’s most potent offensive defenseman since Paul Coffey was winning Stanley Cups for Edmonton in the 1980s. Somehow, the Sharks have been able to keep what has been a very successful core still together in recent years, led by Joe Thornton, Logan Couture, Joe Pavelski, Burns and Marc-Edouard Vlasic. Forward Evander Kane proved to be a steal from Buffalo last year, and now he’s signed long-term as a Shark. Martin Jones remains a very good, young goalie. The only thing that has me a bit worried about their long-term chances is age and injury history. Thornton is 39 and coming off knee surgery. Burns will be 34 in March and Pavelski is 34 already. Can those older bodies withstand another 82-game grind, followed by the ultimate Hunger Games known as the Stanley Cup playoffs? It’s reasonable to wonder.